The "layers of ancient life?" 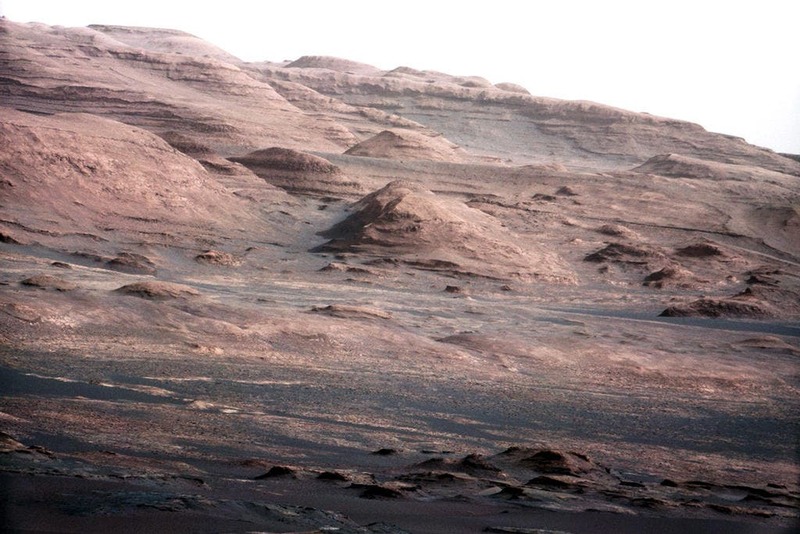 This photo from NASA's Mars rover Curiosity shows the layered geologic history of the base of Mount Sharp, the 3-mile-high mountain rising from the center of Gale Crater, Curiosity’s ultimate destination. Image taken on Aug. 23, 2012. Data from orbiting spacecraft suggest that deposits on the mountain’s lower shoulders were formed in water, which represent the science team’s optimal chance of working out whether microbes could have lived on Mars billions of years ago. John Grotzinger, chief scientist for the mission said that "All those materials are derived from the erosion of those mountains," he added, explaining that the sediments were brought down into the crater by water that once pooled there. These signs of water on Red Planet hint that some form of life was once likely — even though Mars is now a dry place with a thin atmosphere, extreme winters and dust storms — and they're Curiosity's reason for being. The nuclear-powered Curiosity rover is designed to hunt for soil-based signatures of life on the Earth's nearest neighbor and send back data to prepare for a future human mission. It is the biggest robot ever built for planetary exploration — weighing in at a ton, about the size of a small car — and carries a complex chemistry kit to zap rocks, drill soil and test for radiation. The primary goal for Curiosity is to look for chemical evidence of ancient life preserved within exposures near the base of a five-kilometers high mound of layered materials at the center of Gale crater." An instrument on Curiosity can check for any water that might be bound into shallow underground minerals along the rover's path. Today the Red Planet is a radiation-drenched, bitterly cold, bleak world. Enormous dust storms explode across the barren landscape and darken Martian skies for months at a time. But earlier data from the Mars Reconnaissance Orbiter suggest that Mars once hosted vast lakes and flowing rivers. "Gale Crater and its mountain will tell this intriguing story," says Matthew Golombek, Mars Exploration Program Landing Site Scientist from JPL. "The layers there chronicle Mars' environmental history. *The red planet, says Robert Zubrin, founder of The Mars Society, is essentially a Rosetta stone for determining the prevalence and diversity of life in the universe. "If life will develop wherever it has a decent planet, it means that the universe is filled with life," Zubrin says, "And if life is everywhere, it means intelligence is everywhere. It means we're living in an inhabited universe. This is something that thinking men and women have wondered about for thousands of years." There's a good chance Curosity and the Mars Science Lab will finally answer.